Invenio is the Latin translation for “discovering”/”coming about”. At Invenio, we start by finding out what you want to accomplish, then assess what is and isn’t working right now. Thus, we help you reach your potential as a person, or as an organization, through our different coaching, training, and consulting programs. Likely there are going to be strengths to your game that we are going to want to get clear on and leverage like crazy. There are also going to be weakness that need to be addressed, bad habits that need to be shed, and some new management muscles that need to be built. Together, we’ll look at how the weaknesses manifest as problems in your day to day. In addition to concrete problem solving, we will work to expand your thinking and, develop your physical, emotional, mental and spiritual energy capacity, so that you can see what changes you need to make, and have the energy to make them. You identify the kind of leader you want to be and the kind of changes you want to facilitate in yourself and your team. Your coach is there to guide/push/encourage you, make course corrections along the way, hold your feet to the fire when no one else will and keep you focused on your goals. 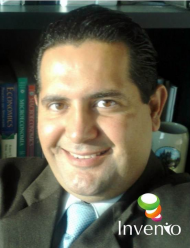 Invenio integrates personal energy management and people management coaching. This unique approach is what sets Invenio apart. I see TetraMap as a unique tool that enables my clients to understand how they team up together, as well as to understand the position they play in the bigger system, e.g. nature. Thus, I find it extraordinary to understand the way TetraMap functions, in order to add value to the organizations I coach and train. Eduardo is one of the best teachers in the ITESM System, he can transform the experience of his professional life to a classroom, giving a excelent course in every chance I had being his student. In his career is a responsable, enthusiastic and happy person, who knows how to manage the pressure with a good attitude in every moment. Always giving a good result. Working with Eduardo or working for Eduardo is a good opportunity of learning not only in a professional way, also in a self-growing form.